Yoshi's Crafted World is rated 4.7 out of 5 by 727. 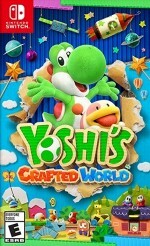 Jump into a new Yoshi adventure in a world made of everyday objects - like boxes and paper cups! As Yoshi, you'll leap up high, gulp down enemies, and set out on a treasure hunt to find all the different collectables. On the flip side, stages can be played backwards, providing new perspectives to explore and new ways to locate some of the more craftily hidden items! It all started when Kamek and Baby Bowser set out to steal a gem-set stone. Legend has it that this fabled artifact can grant the bearer their wildest dreams! But when the artifact's gems are sent flying, it falls upon Yoshi and friends to find them. Luckily, saving the day can be cooperative and challenging. Pass a Joy-Con controller to a friend to team up as fellow Yoshis. Also, Mellow mode gives Yoshi wings for a breezier experience, which may come in handy! Finding all the flowers, coins, and Poochy Pups is no small feat! For extra protection, suit up in one of the handicraft costumes you can unlock in-game!